making: ROBYN'S FETISH CHALLENGE #261 "EASEL CARDS"
ROBYN'S FETISH CHALLENGE #261 "EASEL CARDS"
ROBYN'S FETISH CHALLENGE #259 "USE BAKER'S TWINE"
ROBYN'S FETISH CHALLENGE #258 "PASTEL COLORS"
Good Morning to you all!! I do apologize for not being here last week. I fractured my ankle bone and it has taken awhile to get use to being in a boot that does not let your ankle and part of your foot move. I am pigeon toed so keeping my foot straight is more painful then someone that has feet that actually goes straight. I am so lucky that I have to keep this thing on for five weeks and then see if it fused back together or have to have surgery on it. It has been kicked several times by my kids and my dog so I hope that is not going to be a problem. I love doing Easel Cards. Making them at first was hard but now they are as easy as just making a normal one. Our great sponsor this week is Fred, She Said Designs. The way you will get your images for now is through e-mail. The store is temporarily closed but you will see their images. I love the one that they let me use for this challenge. It's called "Daisies and Ladybugs." The image has a daisy chain and ladybugs by their selves or they are together. I used the chain for creating half a frame and one flower in the corner. It's easier to show you then tell you. Here is the prize they are giving and then I will show you my card. Here is the card using "Daisies and Ladybugs" but I called the card Thank You My Friend. I brightened the picture up so you could see how vibrant the colors look on this card. I think the daisy chain turned out really good. The background actually has big daisies on it but after I finished the card you couldn't see that very clear. You however can see the daisies on the inside of the card. 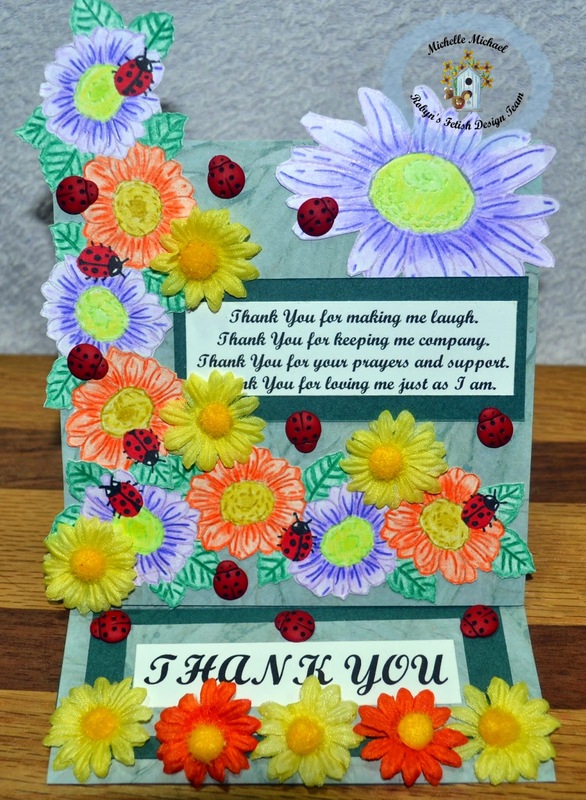 Here are the items I used to make this beautiful Thank You card. Thank You for stopping by this week and I really hope you enjoyed the card. Take a chance with your card and head on over to Robyn's Fetish Challenge Blog and enter. See you next week (if nothing happens LOL). Hi Michelle, That is awful that you broke your foot and ankle. I know just how painful and frustrating that is. I broke mine in 2008. How in the world are you doing anything? I had to stay off mine for 3 months. Wonderful colours Michelle, great easel card Edwina, wonderful DT inspiration.